Wreath season is upon us! While there are either fall-themed or Christmas-themed wreaths in every store, I thought it would be a fun challenge to make one wreath that would both be festive for fall and slide easily into holiday decor as well! Adding some leaf and berry elements give the autumn vibe a nod, but the white and gold color scheme is perfect for bringing in that holiday glam. Let’s get started! I got most all my floral items from Michaels, so check your local craft store and see what options they have in the floral department. Choose two or three different types and sizes of flowers so you have a varied look. I like having the bit of black in the middle of the white poppies. A little bit of contrast can be nice as well. Since I wanted to add some gold into the design, I spray painted the front of some faux leaves to get that gilded look (or if you find some floral accents that are already gold, that works too!). Since I couldn’t find every element I wanted in white, I also used a few coats of white spray paint to get these berry stems the right hue. 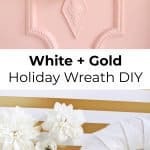 Before I started to add my elements onto my wreath, I cut long strips of white felt in 4″ wide sections and wrapped them around the wreath (securing with hot glue). Covering the sides and back with the fabric helps areas that aren’t covered with the flowers to blend into the wreath rather than stick out when finished. To build up my floral elements, I glued a cluster of flowers in one spot and then wound a long berry stem outside the cluster and around the back (securing it with glue every couple of inches). I cut off the flowers as close to the head as I could so they would lay flat on the wreath when placed. I basically made three clusters of flowers spread out evenly on the wreath (with a berry stem winding around each), and then I started to glue in some of the gold leaves for a bit of contrast. Once I had my three main areas mapped out, I simply filled in the spaces between the clusters with more flowers and leaves until there weren’t any gaps left. Once the wreath was complete, I tied some thick white yarn around two spots at the top to create a loop to hang the wreath from, and I was done! Credits // Author: Laura Gummerman. Photography: Laura Gummerman and Todd Gummerman. Photos edited with A Beautiful Mess actions. I love this idea! My door is dark black and this would be perfect against it! Super nice and creative you girls are. Love it! for winter you can spray some fake snow on it and it will look perfect. I NEEEEED to know more about this pretty pink door! What color is it painted? LOVE the white and gold. I would never have thought of just spray painting the leaves to whatever color you want, haha. Also looks beautiful on your pink door. This is so cute! I need to make this! this wreath looks absolutely gorgeous! I am definitely going to be making one for myself! That is the sweetest wreath I have ever seen! I’m making a wreath for our home this festive season, thanks for the style inspiration! What a beautiful wreath! I love the colours you used! It looks gorgeous! Makes me really want to try it out! Wow! I was JUST thinking of DIY wreath ideas today and what I could do that was a little different! this is gorgeous! I think I’m going to go with a faux eucalyptus and gold wreath this year. So fun! Love the light color palette. Very pretty and it’s nice to see something different than the traditional green and red Christmas stuff. Also I think these are not representing white poppies but white anemones (although they are very similar so maybe I’m wrong). Gorgeous wreath. I love the simplicity of the colors.Thanks for the post. Oh my goodness – now that is adorable. The white and gold will last you all winter long! If I’m feeling really ambitious, I would make four of these for all four seasons – possibly put some orange leaves on for fall; with pinks and yellows for spring and summer. Just lovely! This is just so pretty! I love holiday decor that doesn’t scream RED AND GREEN RED AND GREEN! LOL, this is so chic. And against the pink door? Love it! Thanks for the inspiration! Can’t wait try this one! We just moved in to new home and I was in search of good wreath for my main/front door!